They say people do the strangest things, but clearly that can be said for almost any animal. 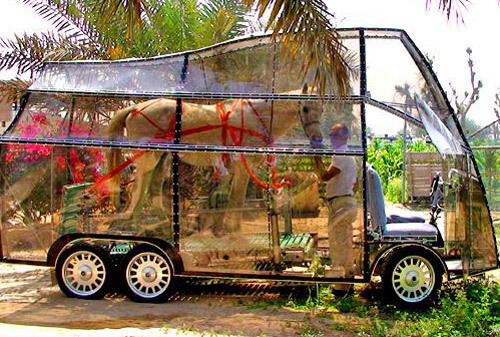 Here are a few examples of horses doing things you just don’t see every day. Can’t say I agree with all (any) of them, but you have to admit, they make you do a double take. Seriously, I’m still walking and you are still sitting? Someone get this man a girlfriend! This entry was posted in Horseplay on October 15, 2008 by The Equinest. Hi im a horse lover and have worked with hores all my life and have seen some funny things but never have my camera handy….but i have lurned to keep it with me. If you catch any of those funny moments on camera, be sure to send them in, we’ll publish them and give you credit. I agree, animals have a better sense of humor than most people. omg this is one of the mos colest picuters i have ever seen in my life:)!&the pictrues are pettry funny. Yeah me too! I love working with hores! the first 2 pics isent very funny it is crule you can see the white of the horses eyes not funny at all obsuly the horses airt enjoying it? its could animal crulty stupid ? got that right they look scared to be like that. That is so mean of the to do that to do that to them. What kind of people would do that to there horse. But what if it was not there horse they should get into truble. I now that a horse is for riding and other thing but they have there own feelings to. So I wouldn’t do that to the horses. there not made for caring lions of bears only humans. that is crulty to them!!!!!!!!!!!!!! Actually, most horses do that when they’re running, most of my horses flash their eyes when they run, and if the horses didn’t like it, the animals wouldn’t be up there in the first place, the horse would have bucked them or wouldn’t have let them get close. (Read the full thing please, especially the end) How dare you! The first 2 are terrible! Awful! In-humane!You can’t do that! It’s animal cruelity! I know I’m not the government, but I am very horse smart AND I know a lot a bout lions and bears and if anything ever went wrong the lion or bear can hurt the horse! Besides you can’t teach a lion or a bear to ride properly so that it’s comfortable for the horse… always thinking of humans I see! Well animal comfort is by FAR more important! Now I suggest you stop this or those horses and other animals will be unhappy for the rest of their lives! But If you choose to be kind to animals, you could always sell the wild animals to a santuary and either sell the horses to good homes or you can start a riding lesson buisiness. I’d go with riding buisiness, more people are going to want to learn to ride than to see animals in distress. And one more thing, you should probably research Monty Roberts, he has great horsey tips! me 2 its cruel 2 the animals!!! i am with you Anymous!!!!! !i love horses they should not be in that torcher!!!!!!!!! I am 100% with you!!!!!!! They are all very funny and needd a heres you sign award i say and did you see that horse with the bear on him? what about the lion one where the horse looks like he’s about to drop his underware. But I agree with Alyssa, it dose look like tocher!!! tehya is so mean she thinks it is funny. Well you are not funny. that could hurt the horse if the lion of bear does somthing roung it could not look pritty. Keeping up those photos that are obviously inhumane not only to the horse but also to the bear and lion shows a warped sense of humor. Can you not see the wrong in this? Putting these under “funny pictures” promotes ill will towards animals…how about we put a human up there and put the lion, bear on your back….funny…. The first two photos show how uncaring humans are — to use animals just to entertain themselves and others or for pure greed/profit. I also don’t think these two photos are funny. Hopefully more people are learning to respect horses and other animals and treat them better. Actually, if the first 2 horses weren’t enjoying it, they wouldn’t be moving, they would be bucking and rearing…. And also, when we take our horses in the fields, they show the white of their eyes in excitement. I am very experienced with horses, and I full agree with Hollie. If those horses did not enjoy it, they would be scared to death, and would not be moving like that. In the first pic, notice the horse is Cantering perfectly? Have you seen a scared horse canter that way? Also, in both the first and second pics, the ears are forward. Pay attention to the ears before the eyes come into account (if you are not standing beside the horse, you cannot tell emotion from the eyes that well). I think the horses are having fun. I am not saying it is safe, but stop criticizing! Also, these are pictures from around the world, not of the owner of the websites! I fully agree with Miriam. And to Paige(?) (I believe that is the owner of this site, from what I’ve read) you have done a great job with the website! I have to state that the ones of the lion and bear I’d probably put under ‘Interesting Photos’ rather then ‘Funny Horse Pictures’. However that is just my own opinion. Firstly, humans are also very cruel to horses, people have stated that the weight of a bear or lion is torture but not stating what humans used to and still do to horses… To start with who states that humans riding a horse is humane?? Thousands of years ago people couldn’t get close enough to a horse to jump on its back instead we used to eat them and some places still do (hence why the still are so scared of people). We have now managed to grow a relationship with these beautiful animals which we are so lucky for (however some people still abuse this relationship). We have even managed to make them, help us hunt down their own kind. Humans however will always change the meaning of the word ‘humane’ for when they feel like doing something (like shooting wild horses) they state that this is now humane to do (Which I find ridiculous). Secondly; A horse can make up its own mind, just like in rodeo the horse would stand completely still if it was scared to death. These horses look quite happy cantering around with the bear and lion on their backs (sure they show the white of their eyes which can mean they are scared but as many people have stated this also happens when they are excited). Sure it doesn’t seem right and in the wild this wouldn’t happen but people will always do something silly to see what happens, hence how technology came along (and without it a lot of people would be lost today). Thanks for your comment Ringer. It’s very true that the ‘western world’ tends to look at animals through very different eyes than many other cultures of the world. Throughout the years humanity has inflicted almost every kind of cruelty possible on the noble horse, as they continued to (willingly) carry us on their backs. Anyone who really cares about animals would not bother leaving an angry comment, they would just go out and do something to stop it. shut your big fat gob paige oh and by the way get your self a boy friend and PAIGE is not a real name so there!!!!!!!!!!!!!!!!!!! I agree with you Miriam, the horse DON’T look that scared. Non the less I don’t think it’s funny. I horses LOVE and i am only 8! Um, alright those of you screaming at Paige over those pictures need to grow up. Did you even read her disclaimer at the top? That she didn’t necessarily agree with them but they certainly made you do a double take? Regaurdless of how you feel about those pics, they do make you take a second look. These are not pictures of her horses so I’m not sure why you are telling her to sell the wild animals and start a riding program? Also, those horse really don’t look very scared… horses can get used to animals like that and learn not a fear them (think of dogs for instance? kind of similar to wolves eh?) I’m not saying that what is going on in those pictures is safe, but I don’t think those horses are being tortured. Eye-white doesn’t always mean fear. You can see the white in my horse’s eyes when he sees a carrot. 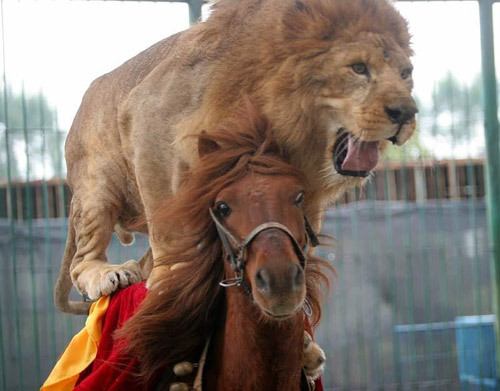 These horse photos are so funny and amazing how did they get that lion and bear do that on the horses back? 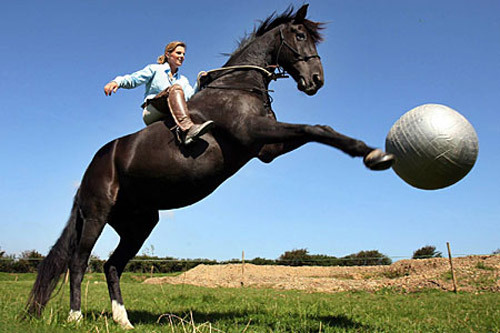 That is so cool how you did that and its funny when the horse is hitting the ball! 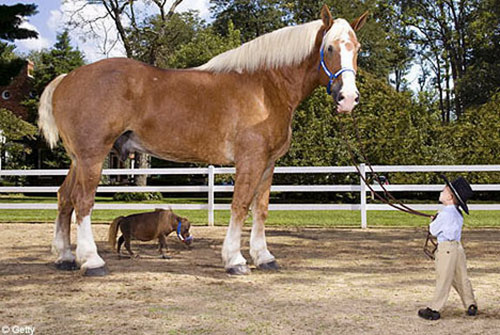 The biggest horse compared to the little horse pic is so funny that horse is way small who would even ride that and the biggest horse who could ride? I don’t have a horse but i really want one really badly and so doesn’t my friend bree! The smallest horse on the last pic, I met her and her owners, they where visiting a hospital my dad used to work at. She was SOOOO sweet! OMG! Those pics are so funny! I dont think som of them are real though! Two very important points here. One, you people need to learn how to read and spell. Even the person who pointed out the bad spelling in the first place has typed “intelligent” incorrectly. There is a disclaimer at the top regarding the first two pictures. Two, the last picture is obviously photo-edited. It is easy to tell by the lack of corresponding shadows and light sources. Please, get glasses and a dictionary. you dont half to be a teacher about it and the horses in the last pictre are real but the picture was not taken at one time they added the two. if the lion was really on the horses back i would want to see it in real life. 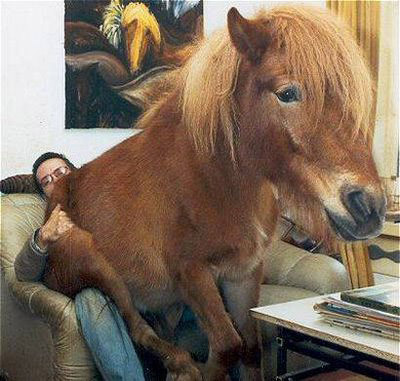 and the pony sitting on the guy is HALARIOUS!!!!!!!!! These are REALLY cute, i posted them on my http://www.howrse.com page. If ya make an account on howrse, your sponser would be horse_luv101 because i told ya about it! yes , i love those funny pic, eapecially horse. i work with horse many horses. wow those pics are cute but funny at the sam time . i loved ‘can you get this man a girlfriend’ its awsome.keep up the good work i dont care wat anybody else says. i love horses and i want to have a farm with a huge field for my horses !!!!! Lol, very funny….. these also make great desktop pics! well, i saw the pictures with the horse and lion and horse and bear in the news paper last year. The photographer took them in a circus in China, i think, and sent outrage everywhere by how cruel it was. A small pony carrying the full weight of a lion?! 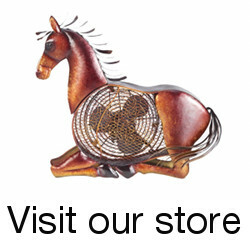 I am not saying it is the website holders falt, i mean the one with the biggest and smallest horse is sooooo cool. I just think the pony and lion/bear is really cruel. Omg i have a horse named Red and i ride at golden gait stabble in sunshine medows. she is a mare and most people think she is horrible but SHE IS NOT and it so funny what she do in the pasture sometimes i always wish i would have had my cam cam. So if YOOOU think my mare would be horrible reply on how!!!!! if you go to golden gait stables for trail rides it is very fun all the horses are nice and sweet like my baby girl red its barn 18 of sunshinee medows and they have very cheap prices. an houer ride is 46$ per person. others have 100$ per person and thats for a lesson. denise ( girl ) has the cheapest prices and really good servic i is so happy to ride there!!! OMG i would love to go there i search on the internet i cant wait to show my family!!! Whatever, (or should i lowercase that… = ) ) why are you on these sites if your gonna be mean to people? it’s very rude… And i’m gonna stand up and say NO 2 this… it’s ridiculous… and u know what? YOUR RIDICULOUS!!!!! SO STOP IT!!!! AND IF YOU HAVE A PROBLEM COME AND CONFRONT ME!!!! Don’t any of you guys know where the spell check is on your computer? This has to be the biggest number of spelling mistakes that I have ever witnessed. What the F…. are you about. Ignorance reins here! guys. ok I’ve been reading this #1 the 1st two photos are most likely a circus over seas. #2 am i the only one that sees the bear is chained to the horse by the nose? #3 the horses are trained to accept it. they may not like it but NOT ALL HORSES BUCK. then end. I have a mare who HATES to be ridden by men (because she was abused by one) but she doesn’t buck them off. please do not take anything I’ve said the wrong way i am not ‘attacking’ anyone. just stating my opinion like the rest. Lady’s and Gentle men, even though i don’t like these photos either, cruelty to the animals would be if the animal was strapped down to the horse with claws baring into it’s back with no protextion. The lion and bear, had every opportunity to jump off, and the horse had every opportunity to get that animal off its back. I guess you feel the same way if a cat or dog was put on to a horses back? Please do calm down, there was no harm to the lion, bear, or horses nor were they there against their will, so there is no need to be so upset. those horse pic are so funny.I will be a horse traner wene i grow up that is how much i like horses and i even want one but i cant cause i live in Iowa in a street in a house and i dont have anofe room for one. These pics are hilarious and cute. i love horases. You people seriously are concerned about the wrong things. a horses back? What is wrong with you people? This is a cool website i have learned alot and got some laughs thank-you and i hope you will make another website full with more information. Haha that was funny. I’ve never seen such a thing in my life before. what the fuc is this suposed to be. THIS IS SOOOOOOOOOOOOOOOOOOOOOO STUPID BUT FUNNY!!!!!!!!!!!!!!!!!! ITS NOPT FUNNY AT ALL ITS HORIBLE!!!!!!!!!!!!!!! Non of these are funny. 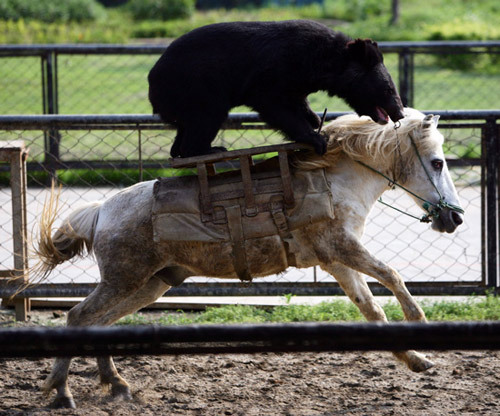 The horses with bears and lions on their backs are terrified – probably from China – no human right no animals rights. These are obscene. Hate them. 1. ur all socially interupted freaks if you thinks this is funny. its called animal abuse.go eat a pair of socks. 2.so what if we have ”spelling errors” who gives a fudge?its a computer for keyboards sakes!if you dont like it, dont read it. ur a sick lowlife and ur face is funny so HAHAHA. 4. ya, im 12, and im not afraid to say what i wanna say.u probably dont know me in real life, so wat r u goin ta do??? BTW cant you see the bears nose is chained to horses reins and you care about is the poor horse? i like horses,bears and lions but all of them are equal so stop fussing about the dang horse!!! U PPL NEED TO GROW UP!!! hey ‘inteligent one!’ you spelt ‘inteligent’ wrong.